These easy appetizers are always a hit at parties! 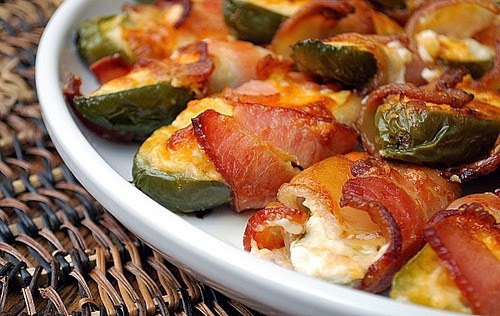 Zesty strips of chicken and bits of onion sit in jalapeño halves that are wrapped in bacon and grilled. Serve them with blue cheese or ranch salad dressing for dipping. 1. Cut chicken into 2 x 1½-inch strips. 2. In a large resealable plastic bag, combine the garlic powder, onion powder, pepper, seasoned salt and paprika; add chicken and shake to coat. 3. Place a chicken and onion strip in each jalapeño half. Wrap each with a piece of bacon and secure with toothpicks. 4. Grill, uncovered, over indirect medium heat for 18 to 20 minutes or until chicken juices run clear and bacon is crisp, turning once. Serve with blue cheese or ranch dressing. Note:When cutting or seeding hot peppers, use rubber or plastic gloves to protect your hands. Avoid touching your face.